Just smoke cigarettes. No brand advertized whatsoever. This was because in the Soviet times all the factories were controlled by the ministries, which were specifying the amount of goods to produce. So to meet the goals (fulfill the plan, sent down by the Party) the ministries were issuing orders to the factories and works to make quantities of, say, cigarettes for a certain amount of money. The factories were producing them, utilizing the suppliers (which were in tern coordinated by the same ministries) and paying with the money from ministries. The stores were to sell these goods at fixed prices. A planned economy that is. The only thing not set in the equation was the client. This year he needs more shoes, next time the interest is driven to hats. The planned economy is too sluggish to follow the trends, and moreover it cannot follow the demand, resulting in constant shortages. This very poster advertises cigarettes as a product. The reason for this is that the majority of the Soviet citizens were smoking homegrown low-quality tobacco (makhorka). 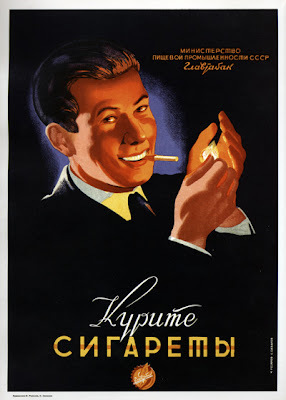 The ministry of Food Industry (GlavTabak) – mentioned in the right top corner of this poster, had set increase of cigarettes’ production as their goal in the Five Year Plan, so to increase the demand for the expensive smoking products (and cigarettes were high-priced compared to makhorka) this poster was published. The man on the poster is a Russian version of a Marlboro Man. He symbolizes the best personal qualities needed after the war. This is a Soviet engineer or a scientist: young, educated and handsome as well – this is an advertizing poster after all. The country was deep in the Cold War and the only way to win it was to advance technically and industrially. For the next ten years this is the scientist who is the positive protagonist of the Soviet culture. I'm confused. A previous poster was against vodka drinking, but wasn't vodka production a state monopoly too? medhbh: In a planned economy the goal is not to increase consumption, but to bring it in line with the plan. Presumably there was a shortage of vodka and/or an excess of consumption. Contrarily, perhaps the poster was not from a production ministry but from an office of social welfare that saw excess drinking as a problem. Just like any other government, one hand is often clueless as to the actions of another. today, with all we know about the hazards of smoking, this poster seems sooo unbelievable! file this one under "my, how times change".